Network Rail have published their South London Route Utilisation Strategy, which propose forthcoming changes to services. There's a bewildering amount of information included (not to mention the diagrams), but here are some highlights related to high-profile schemes. The East London Line phase 2 extension via the South London Line is recommended. The South London Line service from Victoria to London Bridge is almost certain to be withdrawn, but they propose several replacement services that will use sections of the line (diagram on page 99), so most journeys should still be possible direct, and all will with a same platform change at Denmark Hill. This excludes Battersea Park, which will lose its SLL platforms when its others are extended. The Southern Watford Junction-Brighton services via the West London Line will be curtailed at South Croydon in 2009. An extra (possibly peak-only) service on the West London Line will run all stops Shepherd's Bush to South Croydon. Not going further north means 8-car third rail only trains could be used. Trains will reverse in the closed Eurostar depot north of Shepherd's Bush. It's acknowledged that the Thameslink Programme Key Output 0 has slipped to March 2009 (page 5 and 140). The Moorgate branch lives on! The 2011 service (Key Output 1) will add Rochester, Maidstone East, Sevenoaks, Orpington and extra stopping services to Three Bridges. 4 tph (trains per hour) fast-ish to Brighton, 4tph semi-fast to Gatwick and Horsham, 4tph slow to Sydenham and beyond, 2 tph to East Grinstead and 4 tph to Orpington and beyond via Lewisham (all 12-car via London Bridge). Via Elephant and Castle there will be 4 tph on the Catford Loop and 2 tph into Kent, all 8-car trains. Note the disappearance of stalwart proposed distinations such as Dartford, Eastbourne, Ashford, Littlehampton and Guildford and the curtailing of the Wimbledon Loop at Blackfriars. For other suburban services, there are 10 and 12 car extensions planned and lots of other enhancements, but there's far too much to even summarise here. Interseting that the Wimbledon loop will terminate at Blackfriars. Of course this is also the part of the existing Thameslink that wasn't going to have its train lengths extended. I wonder if it might revert to the Southern franchise - or even to LO? There is indeed a lot of information, but I wouldn't say that it is bewildering. The report is structured by time period and presents quite clearly what is planned to happen in each of those periods (and why). It has always seemed likely that the Wimbledon Loop trains would terminate at Blackfriars, because the bay platfroms were being moved to the west side of the layout at Blackfriars and because it would be difficult to make these trains into 12-cars. The surprise is that this wasn't stated clearly before. I am confused about something. Perhaps someone can clarify it for me. 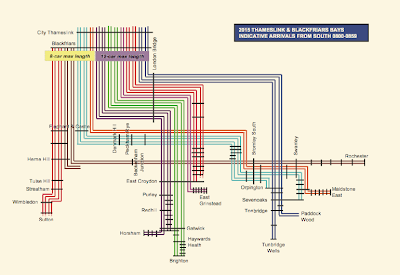 The diagram on page 99 for December 2011 has Nunhead on both the current Dartford to Victoria Service which has 3 trains per hour at peak times and the new Bellingham to Victoria (2 trains per hour). Yet by 2015 (p113) Nunhead has only 2 trains per hour to Victoria. Will Nunhead therefore be removed from the Dartford to Victoria service at some point? Hang on - are you saying that after you promised me (only joking!) a Thameslink train on the Sidcup line in time to get me to the Olympics the other day, in your 'Thameslink 2000 visibly happening' post's comments, Network Rail have stepped in only days later to dash my hopes for ever? Will Thameslink 2000 stop at Hither Green? One of TfL's options for the Croydon Tramlink involves converting the Wimbledon-Sutton line to trams doesn't it? Looking at the Thameslink map the other side of the loop (via Mitcham Junction) isn't shown, so will Sutton end up losing its Thameslink connection altogether? I'd hope the dot dot dots after Sutton represent the route back to Streatham via Mitcham Junction. That side of the loop is part of a fairly major through line, and includes Mitcham Eastfields, so I can't imagine it being closed or converted. At least two of the dots below Sutton do represent the rest of the Wimbledon Loop - from which the corresponding services will terminate at London Bridge (so we'll have something similar to the SLL service insofar as both the extremities are London Terminals). Whether the other two will depends on how 4 of the 20tph planned for the London Bridge bay platforms during the high peak hour are distributed (the explanation is somewhere in Chapter 9). So that means 24 trains an hour will be heading on the through route south to at least 7 destinations (plenty of scope for delays at this density, especially in the northbound direction as they all converge on Blackfriars). Where will they all be coming from? Will they all come off the Bedford line, or will some of them be services currently terminating at Kings Cross? Am I alone in thinking that the simple north london pattern of services, with all trains from one out of town destination going to one London terminal ( or in this case funnel) gives a much more reliable service than the south London spaghetti tangle that these plans will complicate further? Believe it or not, the planned service patterns south of London Blackfriars were originally even more diverse (there used to be 10 or 11 routes I think), and the original termini were in general also further away. At the moment it is expected that 16tph will come from the Midland Main Line and 8tph from the East Coast Main Line. Every time someone suggests simplifying the service pattern a little bit in South London, there are complaints (eg the fuss about the lack of through trains from Greenwich to Charing Cross). Alan: The current planned split is 18 tph from the Bedford line and 6 tph from the Peterborough/Cambridge line (ie King's Cross trains). From whom did you hear that? It was only last month that a 16 MML/8 ECML split was mentioned by Network Rail. Bugger - yes. 16:8, down from 14:10 in earlier proposals. I'd mentally subtracted another two. Another interesting change is the reduction from 25 tph to 20 tph (peak) at Cannon Street. Cannon Street trains have, and will continue to have, only three platforms at London Bridge; two in the peak direction and one in the off-peak direction. The current 25 tph to Cannon Street is made possible by running empty trains (ECS) in the off-peak direction from Cannon Street to Grove Park sidings via Blackfriars (where they reverse) and Nunhead. The changes at London Bridge will block off the ECS route, limiting the tph that Cannon Street can accept to 20 tph. So 4 tph will go to Thameslink instead of Cannon Street. These are the Tunbridge Wells and Paddock Wood services of 2 tph each. South Eastern suburban routes are better suited to 20 minute service patterns than the usual 15 or 30 minute service patterns. Therefore no Dartford routes to Thameslink. Besides, Dartford already has routes to Charing Cross, Cannon Street and Victoria Eastern. The route via Greenwich will only have Cannon Street service, because it will not be able to cross the Thameslink tracks. To reduce crossing movements, routes via Herne Hill will terminate at Blackfriars bay platforms, whereas routes via Catford will continue north of Blackfriars. That's why the Wimbledon and Sutton route will terminate at Blackfriars. They have tried to keep Thameslink routes to 4 tph, or at least 2 tph. That would explain why Eastbourne and Littlehampton are no longer to be Thameslink routes. The number of southern Thameslink routes has been increased from eleven (far too many) to twelve, each having 2 tph. But ten of them merge into pairs giving 4 tph per pair of routes. Two unpaired 2 tph routes are necessary to keep the 6 tph via Elephant & Castle and 18 tph via London Bridge. 18 tph is necessary to take full advantage of the London Bridge route, and because of limited capacity at Herne Hill and on the Catford loop. Having now read through the whole RUS again, I would propose that the WLL Southern service will no longer run from Watford Junction, but Shepherds Bush. The heavy hint is the bit about using DC only units, and using the lines into North Pole depot as a turnback location. The Watford Junction service wouldn't be covered by this RUS as it runs fast through South London - but then the Brighton Main Line RUS proposed it become a stopping service, so it then it would be covered. I'm assuming a lack of joined up thinking between the two proposals, and the only way to join them up is to merge the WJ service and the Shepherd's Bush terminator. Up to 32 trains an hour will run between London and the south coast along Thameslink routes by 2015, according to information contained within Network Rail's newly published South London Route Utilisation Strategy. The funny thing is, they're displaying the same diagram (clearly showing that 8tph terminate at London Blackfriars) as the one on your site!